Sadio Mane ended Southampton’s goal drought at home by scoring a late winner against Crystal Palace to send the Saints fifth in the Premier League. 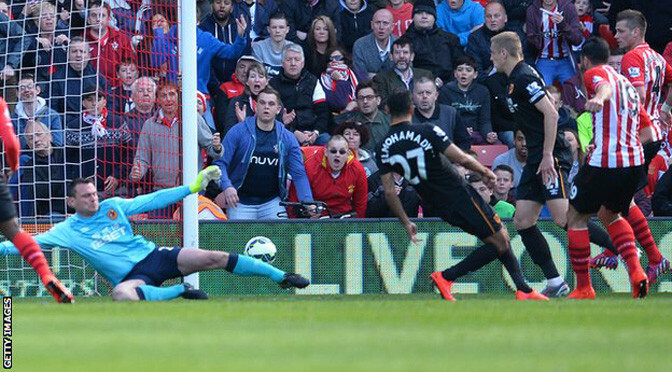 The Senegalese chipped over Julian Speroni after the Palace keeper could not hold James Ward-Prowse’s shot. The visitors had looked most likely to score with Wilfried Zaha striking a post in the second half. But a first home goal in four games handed Alan Pardew a first away defeat since becoming Palace boss in January. For long periods in the game it looked like Southampton’s woes in front of goal would continue. Mane was guilty of several glaring misses in the first half, but the introduction of substitute Ward-Prowse made a difference as his surging run led to a first Saints goal in six hours and 27 minutes at St Mary’s. The result was also a first victory in four league games for Ronald Koeman’s side, who remain in contention for a Champions League place despite their recent poor form. They are now a point behind fourth-placed Manchester United, having played a game more. For much of the first half the hosts clearly lacked confidence in the final third despite enjoying the vast majority of possession, with Eljero Elia finally testing Speroni five minutes before the break. Graziano Pelle, who has summed up Southampton’s dip in form, failed to take advantage of the rebound as his personal goal drought extended to 11 league games. The visitors, who were without the suspended Mile Jedinak and Glenn Murray, offered little in response during a drab first half, and were content to defend in numbers. They claimed that Yannick Bolasie and Dwight Gayle were brought down in the penalty area, although both appeals were muted. This was Alan Pardew’s third trip to St Mary’s following a 4-0 defeat as Newcastle boss earlier in the season and a win with Palace in the FA Cup in January. Yet having soaked up the pressure in the first half, his side became more expansive after the break. First Jason Puncheon drew a decent stop from Fraser Forster before they created two chances in succession as Bolasie tested the goalkeeper and Zaha hit the post. Sensing a change in the game’s flow, Koeman brought on Dusan Tadic from the bench and the Serb almost set up the opener when his corner was flicked on by Pelle with Maya Yoshida unable to guide his touch goalwards. But it was Ward-Prowse’s intervention which proved decisive as he created the opening for Mane, who scored his sixth goal of the season. West Brom took another big step towards Premier League survival as Saido Berahino’s strike proved enough to beat Champions League-chasing Southampton. 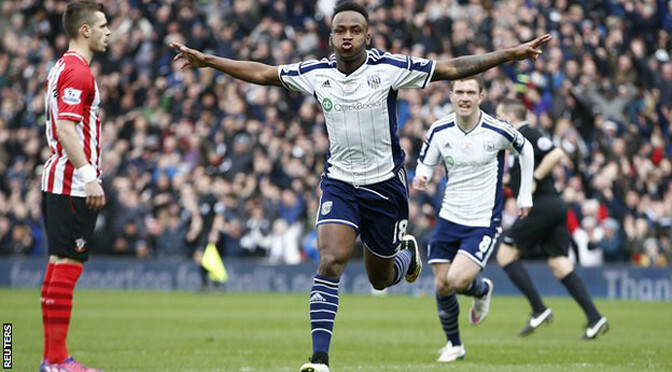 Berahino scored after just 71 seconds at The Hawthorns when he rifled in from Maya Yoshida’s headed clearance. 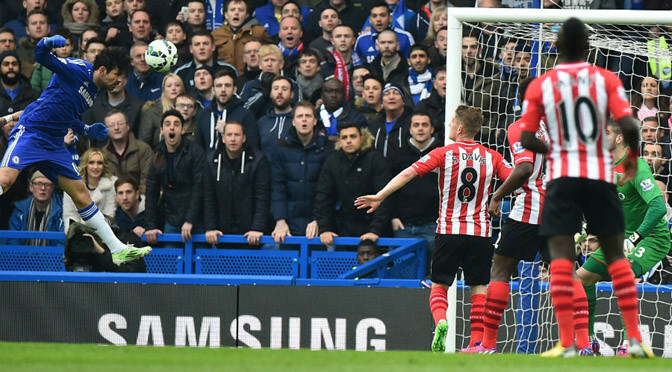 Graziano Pelle squandered Southampton’s best chance when he failed to tap in Ryan Bertrand’s excellent low cross. West Brom headed into the match with the same team that drew 0-0 at Sunderland after top-scorer Berahino passed a late fitness test to take his place up front alongside the club’s record signing Brown Ideye, who had scored four goals in his last four games. And when Chris Brunt’s free-kick was only half-cleared by Yoshida, it was Berahino who was on hand to fire the rebound into the top corner from the edge of the box with barely a minute on the clock. Koeman began the match with three at the back in a changed 3-5-2 formation as he looked to shake up the team following last week’s disappointing 2-0 defeat at home to Liverpool, which saw the Saints drop out of the top four. Sadio Mane was dropped to the bench for that Liverpool defeat after turning up late, but was restored to the side at The Hawthorns and provided the Saints’ main threat in the first half – albeit firing over from long-range and then missing the target from inside the box. Liverpool moved to within two points of a Champions League place by scoring with their first two shots on target at fifth-placed Southampton. Philippe Coutinho scored with a 25-yard curler in the third minute. Southampton had two early penalty appeals turned down, as challenges on Filip Djuricic by Emre Can and Joe Allen went unpunished. Raheem Sterling also had a penalty claim rejected, but made it 2-0 when Matt Targett failed to clear a cross. Liverpool are the only team not to have lost a Premier League match in 2015 and are well placed to push for top-four finish in their final 12 matches. The result saw Brendan Rodgers’ side leapfrog Tottenham into sixth and left them three points behind third-placed Arsenal. 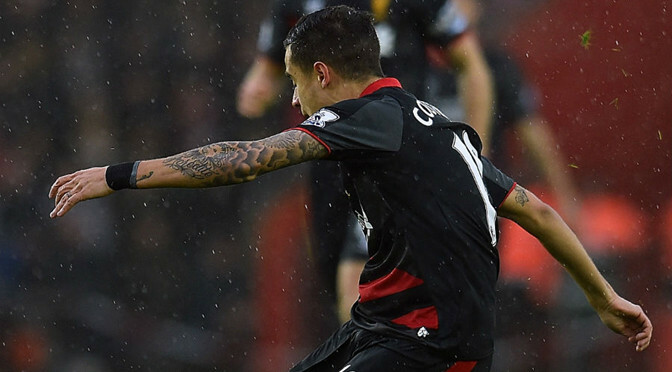 They had to ride their luck, though, to hold on to the early lead given to them in spectacular fashion by Coutinho. The Brazil midfielder gathered Lazar Markovic’s pass and hit a third-minute strike that bounced in off the underside of the crossbar. Liverpool had already survived a penalty appeal by that point, as on-loan Benfica midfielder Djuricic burst into the area and appeared to be pushed over by Can, but referee Kevin Friend gave nothing. Southampton were appealing in vain again within a minute of Coutinho’s goal, as Djuricic looked to have been fouled by Allen, with Eljero Elia’s follow-up shot saved by Simon Mignolet amid the confusion. The visitors had a penalty claim of their own rejected when Jose Fonte took Sterling’s legs from underneath him – although the defender could argue he got the ball first. There was more controversy before the break, with Mignolet appearing to handle just outside the box as he raced out to stop Elia reaching Nathaniel Clyne’s through ball. Markovic, despite his assist for Coutinho’s goal, looked uncomfortable in the left wing-back role as Liverpool wobbled defensively, and Rodgers’ decision to replace him at half-time with Alberto Moreno gave the visitors a more solid look. The hosts failed to open the Reds up as they had done in the first half, and conceded a second when Moreno broke down the left after Morgan Schneiderlin had given the ball away, and Targett’s scuffed clearance fell for Sterling to sweep in. By then, Southampton had run out of ideas, and Rodgers’ side had a fourth successive victory secured. 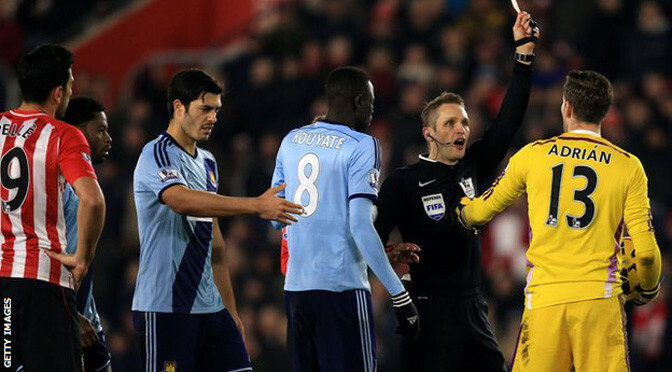 West Ham had goalkeeper Adrian sent off but frustrated Southampton by holding on for a goalless draw at St Mary’s. West Ham’s point came despite an injury to substitute Andy Carroll who was hobbling badly in the closing stages. The Hammers’ first clean sheet in 18 away games means Southampton dropped to fourth, a point ahead of Arsenal. Few Saints’ fans could have dreamed their side would be pushing for a top-four finish when players such as Adam Lallana, Luke Shaw and Dejan Lovren left in the summer but this latest result will feel like a missed opportunity. Ronald Koeman’s side failed to create clear-cut chances before Adrian was dismissed but they dominated the remaining 30 minutes without adding the end product to their approach work. Their manager Sam Allardyce this week told reporters “no coach was more sophisticated” than him in the Premier League and he had to make late adjustments to his side, admitting before kick off his staff “haven’t had any real practice with those available” since Sunday’s draw with Manchester United. Aside from Mane’s run and shot which prompted a Carl Jenkinson clearance in the first half, Adrian was relatively untroubled until the hour mark, where the first sending off of his career arrived. Southampton attacked in waves and Aaron Cresswell’s brave block prevented Nathaniel Clyne’s powerful volley, before Yoshida headed over when well placed. Koeman’s side have now failed to win at home in five of their last seven league games but have only dropped out of the top four for two weeks since September. Southampton have signed Benfica’s attacking midfielder Filip Djuricic on loan for the rest of the season. 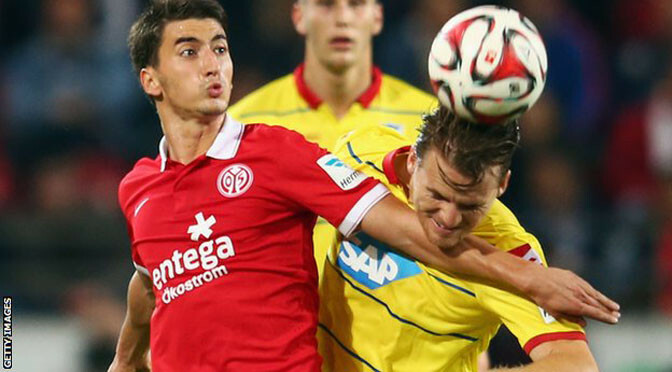 The 23-year-old Serbia international moves to St Mary’s after terminating a loan deal with Bundesliga side Mainz. Djuricic joined Benfica from Heerenveen for £4.5m in February 2013 and made 22 appearances as the club won the Portuguese league in his first season. He then joined Mainz at the beginning of the 2014-15 campaign and made 12 appearances for the German club. Djuricic began his career at Serbian club Radnicki Obrenovac before moving to Dutch side Heerenveen, where he scored 26 goals and provided 28 assists in 111 games, in January 2010. He made his debut for Serbia during that period, going on to win 17 caps, but has failed to hit the same form he enjoyed in the Eredivisie at subsequent clubs. Southampton manager Ronald Koeman confirmed this week that he is also interested in signing Feyenoord’s Tonny Vilhena. 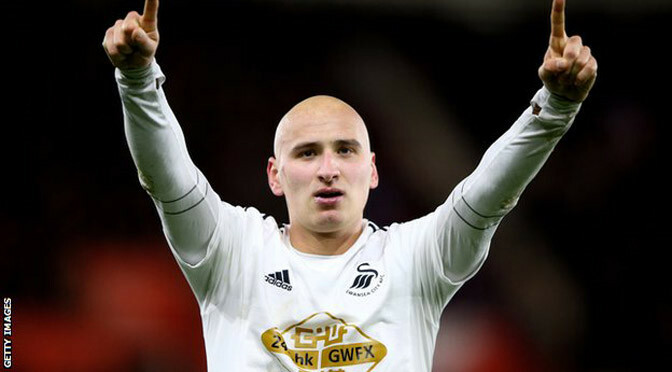 Jonjo Shelvey’s stunning 25-yard strike fired Swansea City to a hard-fought Premier League victory at Southampton. The midfielder had already hit the post before he drilled powerfully beyond Fraser Forster in the 83rd minute. The hosts struggled to carve out chances throughout and their frustration told when Ryan Bertrand saw red for a late lunge on Modou Barrow. The defeat sees Saints miss the chance to displace Manchester United in third, while Swansea climb one place to ninth. 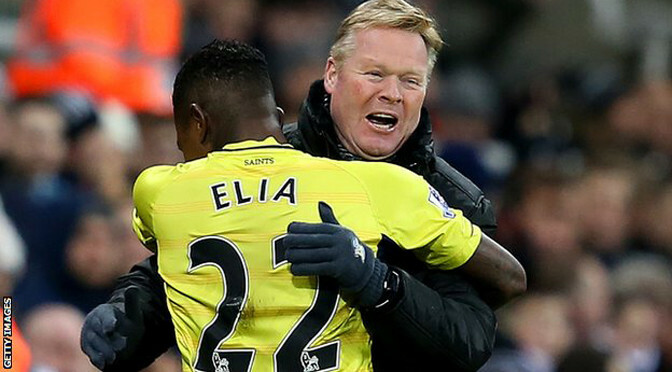 Both teams came into the St Mary’s contest with a point to prove after FA Cup exits and it was Ronald Koeman’s side who looked most determined to make amends early on. They almost made the breakthrough when James Ward-Prowse, fresh from signing a contract extension, saw his shot from a Nathaniel Clyne cross saved by the right boot of Lukasz Fabianski. England right-back Clyne, who was the subject of reports linking him with a transfer to Manchester United, looked bright throughout the game. Midfielder Jack Cork, who left St Mary’s to join Swansea on Friday,signed too late to be thrown straight into a meeting with his former employers. Swansea boss Garry Monk was also without the suspended Gylfi Sigurdsson, leaving the visitors shorn of creativity in the final third, but Bafetimbi Gomis did his best to provide the spark for the Swans with a lovely take and first-time shot that flashed just wide after 13 minutes. The Saints remained dominant in possession as the match moved into the second period, with Fabianski only lightly employed to keep out a clutch of Ward-Prowse efforts. As with Gomis’s chance in the first half, Swansea nearly sucker-punched Saints when Shelvey’s low drive from distance came back off the post with Forster beaten. But Shelvey made no mistake when presented with a shooting chance with seven minutes remaining, lashing a brilliant strike beyond Forster. Southampton surged forward in search of an equaliser but were thwarted by Swans captain Ashley Williams, who twice cleared off the line from substitute Sadio Mane. Home hopes were finally extinguished with the 89th-minute dismissal of Bertrand, who went in heavily on Barrow, leaving the young forward to be taken off on a stretcher. Marouane Chamakh struck twice to inspire Crystal Palace to a thrilling win at Southampton and a first FA Cup fifth round appearance in five seasons. The striker slid in a rebound to level Graziano Pelle’s prodded close-range opener as the sides served up four goals in 13 first-half minutes. Yaya Sanogo slammed in his first Palace goal with the aid of a deflection to cancel out Scott Dann’s own goal. And Chamakh sealed the win before half-time, rounding Fraser Forster to net. It was a potent return from injury for Chamakh, who has been sidelined with a hamstring injury since 13 December. His winner confirmed Palace’s second last-16 appearance in 12 years and the striker was superbly supported by Sanogo, Wilfried Zaha and Fraizer Campbell. They terrorised the Premier League’s tightest defence. Ronald Koeman’s side had conceded two goals in a game only once this season but Palace’s three efforts from just 36% possession in the first half underlined their clinical display. Former Newcastle manager Alan Pardew had to defend his approach towards the FA Cup this week, having won just one tie in four seasons on Tyneside – a record he has now surpassed in three weeks at Palace. It is now four wins from four for the 53-year-old and his side ended Southampton’s eight-match unbeaten run in the process. Saints, whose manager Koeman has won domestic cups in Netherlands with Ajax and Spain with Valencia, led twice early on. Pelle’s prod from an in-swinging corner was followed swiftly by Chamakh’s first goal since August, as he bravely followed up on Sanogo’s shot to net from four yards. Southampton, runners-up in 2003, have reached round five in six of the last 12 seasons and led again when Dann skewed into his own goal at the near post, but they again squandered the advantage quickly. Sanogo and Campbell had drawn saves from Forster either side of Dann’s unfortunate moment and they continued to probe – equalising when Sanogo slammed in the exceptional Zaha’s pass with the aid of a wicked deflection. And Palace were ahead before the break when Chamakh collected a diagonal through-ball on his chest before rounding Forster, ensuring both his shots on the day yielded goals. Southampton pushed hard after the break but barely forced a save, with a wall of yellow shirts blocking shots and intercepting in key areas as Palace moved within three wins of a Wembley final.